Midphase may not rank amongst the best-known website hosting services. It does however, outrank a good number of the brand names when it comes to price, ease of use, and reliability. Featuring shared hosting plans that start at less than $5.00 per month, Midphase proved to be something of an enigma during performance testing. While it did maintain a 100% uptime record, our test site experienced problems that negatively impacted average page-load speed. Despite certain speed performance issues, on balance, Midphase has earned 4 stars and the NCM Online designation of RECOMMENDED WITH RESERVATIONS. Midphase offers two shared Linux plans, Personal and Business. Both include unlimited disk space, unlimited bandwidth, 24×7 phone support, a free domain name, and are backed by a 30-day money-back guarantee. Further, Midphase will transfer your existing website files to their servers free of charge. The Personal plan is limited to one website, one MySQL database, and 1000 e-mail accounts. The annual plan cost is only $4.95 per month before the 30% coupon code discount. The Business plan adds unlimited domains, unlimited databases, unlimited e-mail accounts, an ecommerce merchant account, a dedicated IP address, SSL certificate, Stats2 web analytics, and advanced anti-spam e-mail protection. The annual plan cost is $9.95 per month before the 30% coupon code discount. In addition to shared Linux web hosting, Midphase offers managed cloud plans, dedicated server plans, and reseller hosting. Midphase client hosting interface (CHI). Click to enlarge. The Midphase checkout process consists of three steps. In step one you enter the domain name you would like associated with the hosting account. Step two provides the opportunity to review and select additional-cost options. Billing information is entered in step three, while the total amount due is presented for review prior to placing your order. As is our practice, we selected the cheaper Personal plan for review and testing purposes, and completed the checkout process using the PayPal payment option. The PayPal e-mail receipt arrived almost immediately, but the welcome e-mail did not arrive until next day. This would lead us to believe that new Midphase hosting accounts are manually approved and/or manually processed. While the “welcome” e-mail did not contain specific FTP information, it did include the nameservers and a link to the CHI (client hosting interface) account dashboard. See screenshot right. 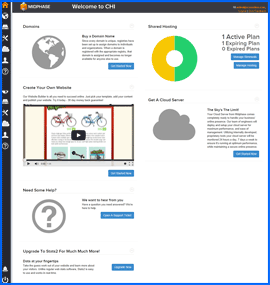 We were pleasantly surprised to find that the dashboard included the cPanel control panel, as well as the Softaculous 1-click script installer. We were able to get our NCM Test Site up quickly and without issue. Midphase Uptime Test Results Chart. Click to enlarge. All web hosting services reviewed by NCM Online are purchased and subjected to our 10-day test for uptime and speed. Midphase testing began on 3/6/14 and concluded on 3/15/14. 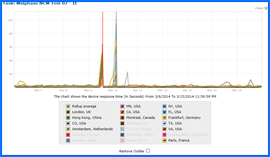 Dotcom Monitor test reports indicated a number of problems with the Midphase server on 3/9/14 and 3/10/14. At 1:25 PM EST on 3/9/14, the server began to respond to attempts to reach our test site with TCP Error Code 10054 (an existing connection was forcibly closed by the remote host). The problem continued for just over an hour. Unfortunately, the same issue reappeared the following day at 3:06 AM (EST) and continued until resolved approximately 24 minutes later. While no further issues were recorded for the duration of the testing, the damage had been done. Midphase Speed Test Results Chart. Click to enlarge. Despite these issues, Midphase was able to produce a 100% uptime score (screenshot above right). This is due to the fact that the server initially permitted access to our test site prior to forcibly closing the connection. 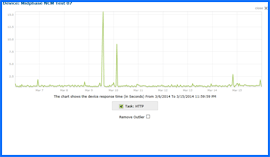 However, the page-load speed averages were negatively impacted. Midphase recorded an average speed of 2.7178 seconds to load our test site from 13 locations worldwide, and 2.3122 seconds from the 7 U.S. locations. See screenshot right. Had we concluded our testing on 3/8/14 — before the problems began — Midphase’s page-load speed averages would have been markedly better. Between 3/6/14 and 3/8/14, Midphase recorded an average of 1.5265 seconds to load our test site from 13 worldwide locations, and only 1.2405 seconds from the 7 US test locations. A low-cost and easy-to-use web host, we liked everything about Midphase — except the server issues. Midphase has earned 4 stars and NCM Online’s designation of recommended with reservations. Cheap website hosting company price comparisons based on 1-year term list price before coupon/promo codes or limited time/introductory offer discounts. These are the renewal rates for the second year of hosting. To ensure that you receive the most affordable Midphase pricing possible, please visit our Web Hosting Coupon Codes page for current discounts and special offers before making any purchases. Midphase was founded in 1998 by a group of tech geeks who had the goal of helping individuals and businesses connect throughout the world and find success on the World Wide Web. Since then the company has put together a team of personnel that shares the vision and beliefs of the original founders. The firm has carefully selected global locations and personnel to deliver the hosting services that clients desire. The company’s trained teams are based in Salt Lake City and Providence, Utah; Lviv, Ukraine; London, UK; and in Cochin, India. Midphase offers affordable personal and business web hosting packages that have unlimited bandwidth and disk space and include one free domain name and free website transfer by a transfer specialist. The personal package hosts one website while the business package includes unlimited website hosting. The business package also includes an SSL certificate and a static IP. The hosting plans are equipped with an open-source Linux operating system that makes frequent updates easy. The company offers Ecommerce tools, flexible cloud and website design services. Midphase has the experience and knowledge to meet its customers’ website needs, whether they want a personal blog or a website for a small or large business. The company is committed to delivering superior services and helping clients expand their businesses and get the results they want. Customers are guaranteed access to technical assistance and answers to questions any hour of the night or day through telephone, online chat, and email support. The firm has expert system administrators available at all times, so if a problem occurs with a web server at 3 a.m., someone is there to resolve it. Company staff has found that the leading reason why clients leave their existing host and move to Midphase is they’ve experienced too much website down time with their prior hosting company. The company proudly guarantees 99.9% website uptime. Midphase makes employee training a priority so that clients receive premium service with any product they purchase. Midphase only selects the most talented technicians and carefully screens its staff. Half of the company’s staff is fluent in a foreign language, which enables them to better assist clients all over the globe. Midphase’s staff is given the power to use outside-the-box thinking and is motivated to deliver exceptional work. Employees have the freedom to select challenging goals for themselves while following the corporate code of ethics. They are treated with respect and pass this respect on to clients. The company calls their corporate culture Mpower. Midphase’s high-tech infrastructure includes robust hardware and up-to-the-minute networks. As a result clients’ websites stay up and they benefit from super-fast servers that aren’t typical among competitors. The company’s Tier 3 data center for Linux shared and reseller web hosting provides the high level of website security that’s utilized by key financial institutions. The data center is in a disaster-safe area that meets the standards for information management designated by the Federal Emergency Management System (FEMA). This video tutorial demonstrates the installation of WordPress on a Midphase shared hosting account using cPanel and the Softaculous 1-click applications installer.